Archaeological monuments and heritage sites from Jammu and Kashmir have been neglected for long, and have been defaced and damaged due to lack of maintenance. Many structures have been damaged due to fire caused by lightning, short circuits etc. The Kashmir Valley – which is home to several centuries-old shrines built by Islamic rulers – is also known as Peeri Weaar (the valley of saints). A number of structures were built to commemorate saints and religious preachers. The architecture and the design of these buildings are distinctive, and have been attracting people from all over the world. However, due to the government’s neglect, the many forts, palaces, temples, museums and shrines from Kashmir are slowly getting destroyed. Many heritage buildings have been converted into offices for the administrative authorities, like the divisional commissioner’s office in Srinagar. On the other hand, many structures have been completely demolished and complexes have been built on these sites. On December 17, 2017, a 150-year-old dispensary from Maharaj Gunj, Srinagar – which was declared a heritage building by the Department of Archives, Archaeology and Museums – was demolished. The building was built in 1865, and was commissioned by Maharaja Ranbir Singh. It was constructed using stones, bricks of mid-19th century and lime mortar. The wooden roof, supported by bulky round pillars of Greek design, is a common architectural feature of the historical buildings in the Valley. The precious wood which was removed during demolition, and was kept unattended near the site, was eventually used by the shopkeepers in the area as firewood, according to the locals. Kashmir is prone to natural disasters such as floods, earthquakes, water logging due to heavy rainfall, snowstorms, and windstorms. No provision has been made by the government to save the heritage buildings in case of such events. Apart from this, issues faced by these sites include arson, electrical hazards, theft, burglary, vandalism, deterioration due to age, and decay due to lack of maintenance. 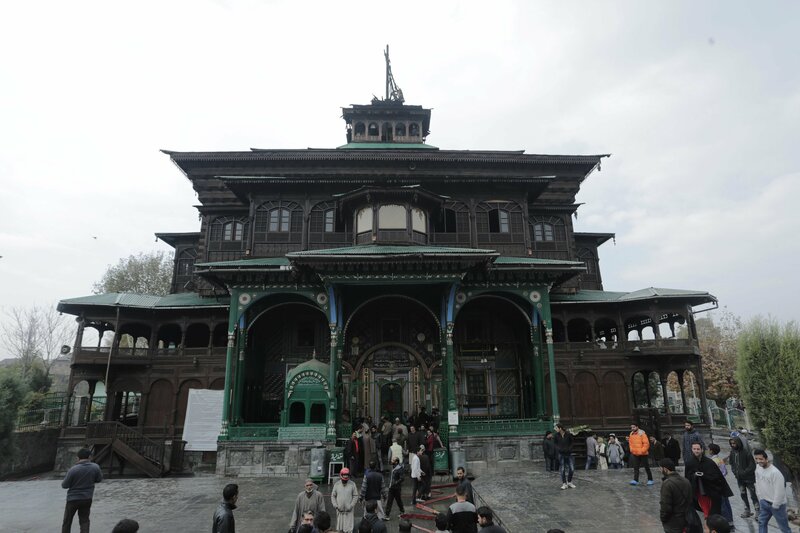 Shrines in Kashmir – the most common type of heritage buildings found across the valley – are made of walnut, pine and deodar (Himalayan cedar) wood, which makes them more susceptible to decay. The ongoing conflict is also one of the major threats to these structures. In 1438, a shrine was built in Charar, Budgam, around the grave of a renowned poet and Sufi saint of Kashmir, Sheikh Noor Din, also known as Nund Resh. It was constructed using pure deodar timber, and exhibited patterns of traditional Kashmiri architecture such as Pinjra Qari, Zoone Dab etc. However, in May 1995, when armed resistance in the Valley was at its peak, around 21 militants took refuge in this shrine. To kill the militants, armed forces used gunpowder to set the shrine ablaze. The blaze not only killed the militants, but also reduced the heritage building to ashes. In lieu of the wooden structure, a new building made of concrete was erected, which had no resemblance with the old structure. Even though most of the shrines have been constructed using wood, no measures have been taken to protect them from fire. There have been several incidents in the past when fire had damaged such structures. Khanqah-e-Moula, which is better known as Khanqah mosque and a shrine of a Sufi saint Mir Sayyid Ali Hamadani was built in 1395 AD by Iranian architects who had travelled with the saint from Iran to Kashmir. On November 16, 2017, the mosque situated on the bank of river Jhelum in the old city of Srinagar, was damaged due to fire. Before firefighters could reach the spot to control the flames, the fire, triggered by lightening at night, had damaged the spire of the shrine. Many staircases have been added to this structure, electric wires have been fixed on the wood, and iron nails have been hammered into the walls. Because of these alterations, the wooden structure has developed cracks. The condition of all the shrines of J&K is more or less the same. At some places, wooden pillars, which were damaged, have been repaired using iron parts. Intricately carved wooden Jali sky lights above the Mehrab have been replaced with glass in the wooden frame. Paintings and carvings on the walls has been damaged due to the new layers of paints, and the cracks in wood have been filled with cement. Before Islam came to Kashmir – in around 14th century – Hinduism was the religion practiced by the major inhabitants of the Valley. In Naushara, two Shiv Temples at Vichar Nag (spring), located on the outskirts of Srinagar, were built by King Meghwahan’s wife Queen Amrita Prabha. Historians believe that the temple was built in the 10th century. The temple stood next to the Anchar Lake. One of the temples was famous for its spring and its unique stone Shiv Lingam. Large devri (lime stone) stones were used for construction of stairs to the spring on West and South side of the temple. At present, the temples are in a dilapidated state, and parts of the temples are lying in the courtyard, while most of the stones were looted by people who lived nearby for construction of their residences. The temples has received no attention from the authorities. The land, which belongs to the temples, was also taken over by local people. The encroachment in the area has worsened the condition of the temples. Professor Zaheen, who teaches history at University of Kashmir, says that Kashmir’s archaeology and heritage must be preserved. The conservation of these buildings will be a significant step towards this direction. “We can generate huge revenue from these monuments, but government must take serious steps to preserve them. These are the gems of our history. If they will be neglected, our future generation will only be able to read about these monuments in the books,” says Zaheen. According to the research done by the Tourism Department of Kashmir, heritage and cultural sites attract more tourists. As per the Archaeology Department, more than 800 to 900 monuments and heritage buildings are currently unprotected in Kashmir.